Nationality: British. Born: Denholm Mitchell Elliott in London, England, 31 May 1922. Education: Attended Malvern College; studied at the Royal Academy of Dramatic Art, London, 1939. Military Service: Royal Air Force, Bomber Command, 1940–45; held as prisoner of war in Germany, 1940–43. Family: Married 1) the actress Virginia McKenna, 1954 (divorced 1957); 2) Susan Robinson, 1962, two children. Career: 1946—West End stage debut in The Guinea-Pig ; 1949—film debut in Dear Mr. Prohack ; 1950—New York stage debut in Ring around the Moon ; from 1970s—much work on TV, including mini-series Marco Polo , 1982, Bleak House , 1985, Noble House , 1988, and Bankok Hilton , 1992. Awards: British Academy of Film and Television Arts Awards for Best Supporting Actor, for Trading Places , 1983, A Private Function and Defence of the Realm , 1985; Commander, Order of the British Empire, 1988. Died: In Ibiza, Spain, 6 October 1992. Interview in Film Review (London), December 1979. Interview in Radio Times (London), 26 November 1983. "Our Island Story," interview in Stills (London), December 1984/ January 1985. Ciné Revue (Paris), 10 November 1988. Obituary in New York Times , 7 October 1992. Obituary in Variety (New York), 12 October 1992. Obituary in Classic Images (Muscatine, Iowa), November 1992. Obituary in Film en Televisie + Video (Brussels), December 1992. Denholm Elliott is one of those British supporting/character actors whose presence in a film automatically guarantees that, if not of the highest quality, it at least will be watchable and well-acted. In this regard, Elliott may be categorized with the likes of John Mills, Trevor Howard, and Jack Hawkins as dependable British character players who appeared in both English and American-made films, small-scale dramas which emphasized character development, and occasional glitzy big-budget spectaculars. In his look and demeanor, Elliott had the air of coming from the lower levels of the British gentleman classes; he would fit snugly into the role of a clergyman's son struggling to keep his head above the murky waters of the "shabby genteel." Whatever his character's trappings, he never truly could be classy, but rather would seem a poseur. This is effectively communicated in one of his best early roles: Morrell, the young naval officer/barrister turned barrack-room lawyer, in The Cruel Sea . At one point in the film, Morrell (whose wife is a bitchy actress) is on leave, and he answers her telephone only to hear a jovial caller ask if "that clot of a husband" is away. With his quick nail-biter's grin, Elliott could be corruptible. He was expert at playing the complainer, the clever loser, the resentful schemer, the failed gentleman pulled down by his own inherent pretension, who ends up conniving and clawing his way through shabby schemes and deals. His range also extends, however, to brave, despairing—and, ultimately, ill-fated—victims of duty. Elliott was cast in some of the finer British films of the 1950s. In addition to The Cruel Sea , he was the doomed aviator forced to test-fly airplanes by his heartless airplane factory owner father (Ralph Richardson) in Breaking the Sound Barrier ; the covetous clerk dogging Trevor Howard in The Heart of the Matter ; and Michael Redgrave's assistant in The Night My Number Came Up . Many of his earlier films were linked to World War II-related themes of sacrifice, but the increased affluence and social mobility of the 1960s (along with the arrival of John Osborne's Angry Young Man) restored to the British cinema a certain cynicism, or worldly wisdom, about snobberies, one-upmanship, the rat race, and unabashed unworthiness. 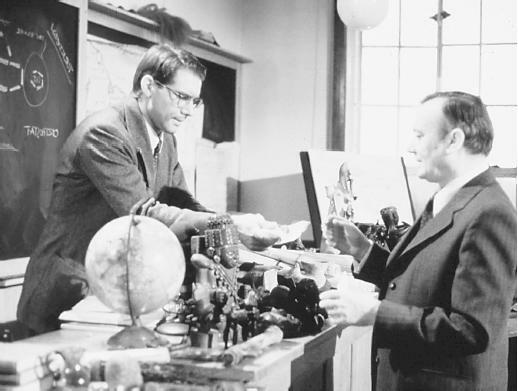 Elliott was suited to such films, and his knowing performance as Charlie Prince, the debased character who teaches manners to an ambitious, social climbing clerk (Alan Bates) in Nothing but the Best , closes off the first phase of his career and serves as a prelude to his future. A perfect follow-up was his distasteful, unorthodox abortionist in Alfie . Elliott's highest-profile roles were to come in the 1970s and 1980s. He was never better as Friar, the inebriated, unscrupulous filmmaker who creates the garish bar mitzvah movie, in The Apprenticeship of Duddy Kravitz ; and Mr. Emerson, the eccentric up-by-thebootstraps businessman, in A Room with a View . He was a solid addition to the cast of Robin and Marian , playing the role of Will Scarlett. All the while, he still gave exemplary performances in lesser-known films: Defence of the Realm , playing a veteran journalist whose mysterious death sets a Fleet Street tabloid reporter (Gabriel Byrne) on a quest for truth; and Bad Timing , as Theresa Russell's wearily resigned Czech husband. In his later years, Elliott's international visibility increased as he began appearing in popular American films. In Raiders of the Lost Ark and Indiana Jones and the Last Crusade , he is Harrison Ford's professional associate. In Trading Places , he is Coleman, Dan Aykroyd's valet, who ends up ministering to Eddie Murphy; his presence is a fine counterpose to John Gielgud's waspish loftiness as another gentleman's gentleman in Arthur . Elliott's roots are in middle-class Englishness, and he fashioned his characters with sympathy and without complacency. He may have been deprived of full-length, in-depth celluloid stardom, but this loss only enhances the importance of the gallery of types and attitudes he brought to the films in which he did appear.